Since November 2009, Senior Operations Manager, Marc Soules, Parking Enforcement Technician, Wendwesen Abegaz, and other team members have been collecting coins and tokens which have been inserted into the parking meters at Pentagon Row, Location 702 and this past November they collected their 1,000th unique ‘coin’. 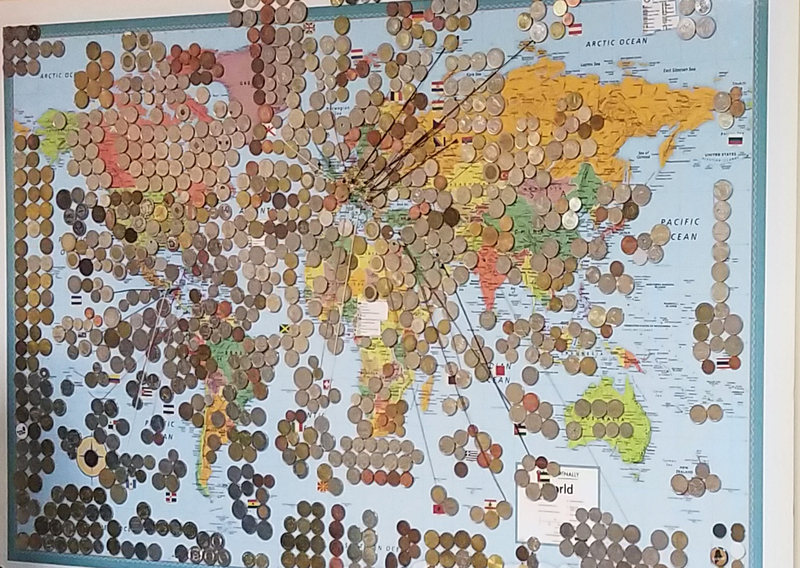 The coins represent 170 countries, including some places which are no longer exist, like Yugoslavia, Czechoslovakia and WWII Germany, as well as some lesser known places, like The Bailiwick of Jersey. Their collection also includes 97 Canadian Commemorative coins, and over 200 tokens and slugs from around the world. They even have an old Colonial Parking® token! All the coins are displayed in the Pentagon Row parking office on a map generously donated by Banana Banner.